Get lost in the wilderness of North America! Many lessons of faith and Christianity throughout this story of a young woman who travels from Dansville, N.Y. to Oregon/Idaho (about 3,000 miles, mostly wilderness) to teach the Nez pierce Indians about Jesus. Strength, determination and perseverance, pushing on when most would give up. A journey even the experienced would find difficult, but she has no experience to draw on. When everything is taken from her, she still has her faith and doesn't turn back. I'm sure, like me, that you will find something within that ministers and strengthens you. She believes strongly in her mission to bring people to Jesus, and has a long and difficult travel. But God uses adversity in many ways. I've done some woods camping so I can appreciate what she went through, but not nearly to the extent. Let alone the threats she encountered. You know you will love a story of Wanda's! A fabulous story to get lost in. Also included in the Collectors's Edition - Woman Of Hope - about her adopted Indian daughter, Little Fawn, who wants to be a missionary to other Indians at a Rendezvous but her mother won't attend or let her go for reasons of her own. When the girl tries to go by herself she is captured and abused, but meaning is brought and God shines through. A wonderful story of deep and abiding faith throughout. 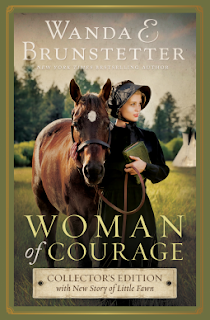 Included is the newly-written sequel, Woman of Hope, with Little Fawn’s story. Raised as an orphan by a loving white couple, Little Fawn always felt something was missing from her life. She longs to take the news of Jesus to the Nez Perce Indians, but despite being a missionary herself, Little Fawn’s mother forbids it. Will White Wolf, her intended, support Little Fawn’s decision when she abruptly follows the tribe’s migration onto the Plains?